An ideal everyday beverage, this Huoshan Huangya yellow tea has a beautiful fragrance, rich taste, and is organic certified. Not many people have heard of this "yellow" beverage, but she is as exciting as any green tea. Whether it is history, harvesting or processing, she reflects the best of Chinese tea. According to historical annals, the first mention of her being a tribute tea dated back to 779 A.D., the time when emperors started collecting tea for his own consumption. So - how is she different from a green tea? When making a green tea, high heat is applied to kill the tea enzymes to halt the oxidation process. If roasting temperature is too low, or the subsequent cooling lacks ventilation, tea leaves will turn yellow. This yellow-ing is a form of "wet oxidation", in the same way that tea reddens when it oxidizes to make oolong or black tea. The key is to control the degree of "yellow-ing" so that the right chemical changes take place. The yellow-ing effect is achieved by using a lower roasting temperature longer. After roasting, the leaves are wrapped in paper to encourage them to turn "yellow". Therefore a yellow tea can be considered a slightly to moderately oxidized tea. It contains the same level of theanine as green tea, but lower level of antioxidants and higher level of aromatic oils. Needless to say, this is a difficult process that takes many years to master. This is the reason why high grade yellow tea is rare and much sought after. One of our best selling product in this tea shop is the Maofeng A grade, an organic certified everyday beverage available at a very reasonable price. Many customers rave about it, you can click to read the reviews here. We launched the tea in 2009 and it took us nearly ten years to find another tea offering similar level of quality and value of money.Yes, I am talking this Huoshan Huangya A Grade! Like the Maofeng, Huoshan Huangya also comes from the Anhui Province. This A grade is grown in the belly part of Dabie Mountain - Tong Luo Zhai (铜锣寨) - at a high altitude of 850 meters. 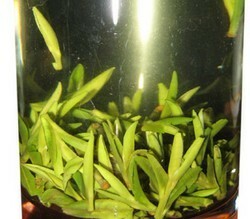 I personally consider Huoshan Huangya to be the best yellow tea available in the marketplace. With low level of oxidation, she looks and tastes much like a green tea but is high fragrant. In fact, a Huoshan Huangya is said to contain as many as 46 different types of aromas. As you know, every tea sold in this shop has to have a minimum level of standard. We won't sell something just because it is cheap and marketable, both me and HQ have to like it! I am proud to say that she has enough quality to be highly likeable. As this is a late spring harvest, the tea buds are larger than our other offerings, which makes her an A grade. Steep her near boiling water and you can see the quality for yourself. Her liquor turns bright, clear, yellow quickly. A floral fragrance permeates the air. The body is rich and pleasant and she can be infused for three times. 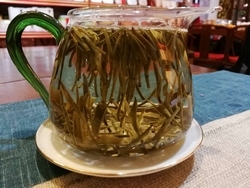 This Huoshan Huangya is organically certified under the strict EU regime. Widely recognized as one of the top three yellow tea in China, the Mengding Huangya tea comes from the magical Meng Mountain of Sichuan province. Mengding Huangya has a long and illustrious history. She has been a tribute tea since Tang dynasty (600 to 900 A.D.). The name Huangya means yellow buds. It alludes to her leaf style, which for an early harvest like this AAA grade, consists of one bud with two leaves. The tea buds are a pure pleasure to behold. Pour boiling water in glass and watch how they defy gravity and stay suspended mid-water. If I don't tell you she is a yellow tea, you won't guess. The only clue she gives away is the tea liquor color, which is a beautiful yellow. Medium rich in body and a pleasant vegetal in taste, she is easy to like. The aftertaste is long and lasting. I rate it a solid 5 without question. 1- I used water that was too hot. I was steeping at 185-190 which made it quite bitter. 3- Not enough tea leaves used. I then tried a lower temperature range(170-175 for 3-5 mins) with a 3-5 minute duration and upped the tea amount to 4-5 grams. These tweaks made her come alive! I can get three cups of goodness with the above steep parameters for each of the three steeps. First of all, I'm new to drinking good green teas. So I'm no expert because I have virtually no frame of reference. That said, I'll tell you what I think. I like this tea. It had very little flavor to start with but then I noticed it coming on. It does not impart a lot of color to the steeped tea, which I suppose is typical for green teas. Its flavor has astringency with a mellow grassiness scent. The longer you steep it, the stronger the flavor---good for a couple steeps. My experience. I like this better than the 2014 Yellow. That says a lot since I really loved the 2014 harvest. It has a great flavor that I think many green tea lovers would enjoy. An added fun bonus is watching these buds whilst steeping away. I can easily get about three steeps. A real bargain at $16.00 and a hard-to-come-by tea. Thanks so much for this wonderful offering, Julian. I really do appreciate it. considering how long behind the season already is. to get the best out of it. This tea was a good drink. However, it took some care infusing to get good results. I like my teas a bit punchy so I definitely prefer Julian's Dragonwell over this Yellow tea. Yellow tea should be brewed the same way as the Dragon Well tea by infusing a small amount of leaves in high temperature water for as long as it takes.